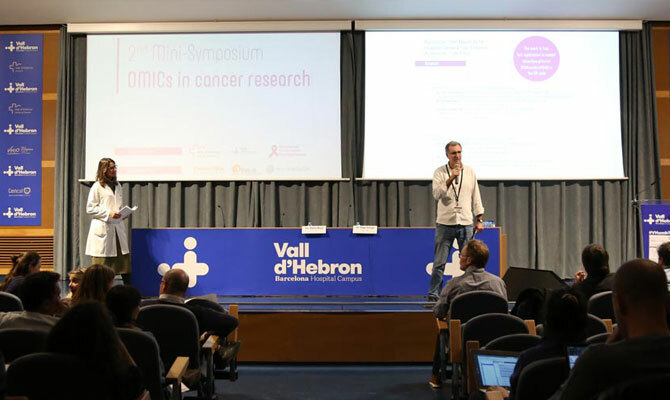 The Vall d’Hebron Research Institute’s Oncology Department (VHIR) has organized the second mini-symposium ‘OMICs in Cancer Research’ in which speakers from different institutions and countries, reviewed the current state of “Omics” in the research of cancer. The symposium was held on the afternoon of March 19 at the Vall d’Hebron University Hospital with a full capacity. The interest that aroused the day was so great that one week before the admission had already been completed (140). Half of those attending were predoctors and postdocs, although there were also principal researchers (IPs) and students of the VHIR translational biomedical master’s degree. “In this context, the subject of the day was focused on the different aspects of cancer research: the study of genes (genomics), proteins (proteomics) or metabolites (metabolomics). This approach reproduces the reality with which will find the future researchers and with whom we already work those who do research in cancer,”explained Dr. Diego Arango, head of the CIBBIM-Nanomedicine. Biomedical Research in Digestive Tract Tumors and coordinator of the VHIR Oncology Area. The first session of the day was attended by doctors Ian Tomlinson, Dr.Holger Heyni and Dr. Ana Vivancos, a member of the VHIO’s genomic cancer group, and was moderated by doctors Rosanna Paciucci and Àgueda Martínez, researchers from the CIBBIM-Nanomedicine. Biomedical Research in Digestive Tract Tumors and the Biomedical Research in Urology of the VHIR, respectively. In the second session led by Dr. Anna Santamaria of the Biomedical Research Group in Urology of the VHIR and Dr. Miguel Segura, from the Translational Research in Child and Adolescent Cancer of the VHIR, attended by doctors Harald Mischak and Oscar Yanes. Among the topics discussed were the use of genomic analysis for the detection of genes in colorectal cancer or the sequencing of tumors to find new therapeutic targets.